After 2 postponements, the Republic Act No. 10756 which was signed by Former President Benigno Aquino III will implement this coming Barangay and SK Elections on May 14. The Election Service Reform Act will let the public school teachers decide whether they will serve as the members of Board of Election Inspectors (BEI) or not while the Commission on Elections (COMELEC) will have an option to choose from other sources. 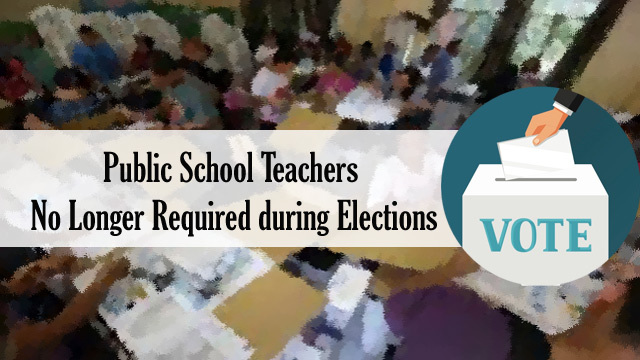 In case of shortage of election officers, the Comelec can appoint from private school teachers, any voter who is honest with no political affiliations, government employees and members of Comelec accredited citizen arms. On the other hand, policemen are the final alternative if there are no qualified volunteers. Under the law, a chairperson of Electoral Board will have an allowance of Php 6000 and its members will receive Php 5000. Meanwhile, the Department of Education Supervisor Officials (DESO) will get Php 4000 and its support staff will acquire 2000. Aside from that, they will also have a 5-day service credit, medical assistance, legal indemnification package and Php 500K death benefit. Because of the new regulation, the Department of Education (DepEd) doesn’t know yet on how many teachers will not serve out of 800K. In more than 177 K clustered precincts, it must have at least 500 K public school teachers who will in charge as a chair, poll clerk and 3rd member of Board of Election in every precinct. For the safety of public school teachers, DepEd are planning to reestablish its Election Task Force and Monitoring Center this upcoming elections. According to Undersecretary for Administration Alain Del Pascua, it will be set up at the Central Office of DepEd in Pasig City. He also advised the regional and division offices to have their own ETF centers. Pascua then explained that they are going to make sure that the teachers and other personnel will have adequate information as well as technical and legal assistance throughout their duties on May 14 elections. They are also planning to have a seminar for those who will serve as chair and Electoral Board and Barangay Board of Canvassers (BBOC’s) members.